Since 1975, he has published poems, drawing, and other writings and art works. In 1980, he began producing visual poetry and performance works around the world. Organizational memberships include: Hungarian Alliance of Writers, Art Foundation of Hungarian Republic, Trans-World-Artlines International Art Association. 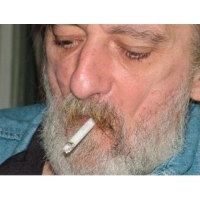 His work has appeared in many Hungarian magazines, including Eső [Rain], Napút [Sunway], Polúsz [Polis], Nyugat Ma [West Today], and others; and anthologies, including Orpheusz �r [Mr. Orpheus], Ezer Magyar Haiku [Thousand Hungarian Haiku], World Haiku 6 (Japan, 2010), World Haiku 7 (Japan, 2011),and others. Internacional de Poesia Visual, Diplom (1995, Mexico City, Mexico). Published works: 12 volumes of poetry, 1 book of prose. Haiku: Kado (2007) and Mukkeum Si (2009); a third volume of haiku is forthcoming in 2011. Creative works:  9 individual exhibitions, more than 500 group exhibitions, 70 single performances around the world.